"FRIPP SIMPLE GHOST CRAB TRAP"
Cut a hole in the bottom of the gal.. jug to the circumference of the qt. bottle sized to fit snugly. Cut the ends OUT OF the qt. bottle leaving a 1/8" curved inside lip. 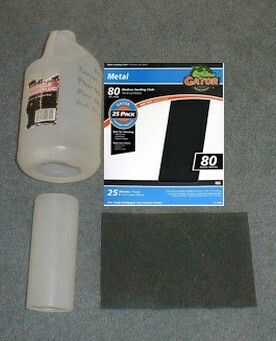 Trim the sheet of sandpaper to 1/4" shorter than the height of the qt. bottle. 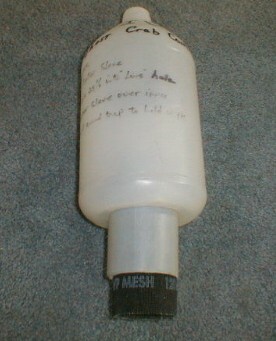 Roll the sandpaper sheet into a tube with the smooth side out sized to fit snugly into the qt. bottle. Slide this rolled tube into the qt. bottle. Glue the edge of the sandpaper tube at the top and bottom to keep the sandpaper from unraveling (hot melt glue works). If the fit between the qt. bottle and the jug is loose then wrap a dozen or so rubber bands about 3" from the bottom to make a seal. Slide the long end of the qt. bottle into the hole in the bottom of the jug leaving about 3" exposed. Discard the jug's cap to permit the free exchange of fresh air. Place the traps 3" projection inside a "fresh" ghost crab hole and lock the trap in place with packed beach sand. To remove the crab from the trap turn the jug upside down, slide the small container out, place your hand in the opening with the index finger extended, pull your finger out and the crab should be firmly attached. Relocate or recycle the crab as you see fit. Ghost crabs enter the trap as they leave the tunnel at night to re-hydrate. Check the trap the next morning to see if it has been successful. Ghost crabs are good climbers but they rarely go straight up. Place the trap over the tunnel following the angle of the tunnel. Firmly imbed the center tube in the hole and build the sand up around the tube to guide the crab into the trap when exiting the hole.